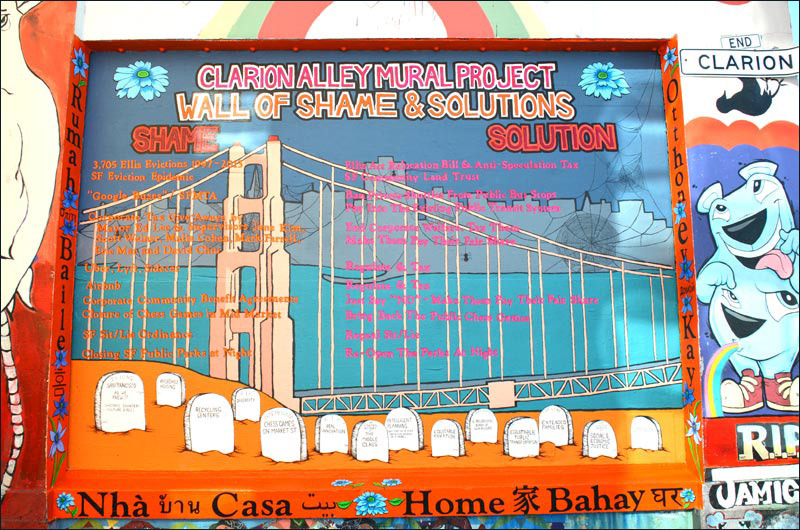 Wall of Shame & Solutions, Christopher Statton, Megan Wilson, Mike Reger, Clarion Alley Mural Project, 2014. Photo by Steve Rhodes. Clarion Alley @ Valencia Street (between 17th & 18th Streets), San Francisco, CA, USA. In a city that is rapidly changing to cater to the one-percent at every level, Clarion Alley Mural Project (CAMP) is one of the last remaining truly punk venues in San Francisco, organized by a core and revolving group of individuals who have collectively volunteered tens of thousands of hours throughout its history over the past 21 years. 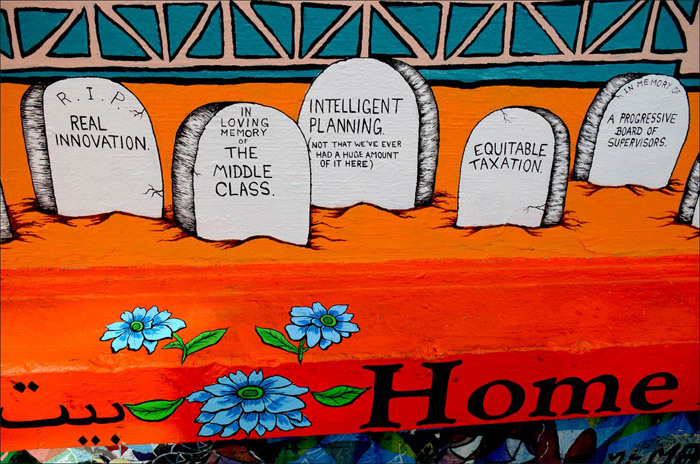 As part of CAMP’s mission to be a force for those who are marginalized and a place where culture and dignity speak louder than the rules of private property or a lifestyle that puts profit before compassion, respect, and social/economic/environmental justice, CAMP artists/organizers Megan Wilson, Christopher Statton, and Mike Reger have just completed Clarion Alley Mural Project’s Wall of Shame and Solutions to address the current crisis of displacement and the dismantling of our city’s historic culture. Wilson herself was evicted in 2008 through the Ellis Act from her home of 13 years. In 2013 she was evicted from her studio at 340 Bryant Street, along with 150 other artists, by developer Joy Ou of Group i to make way for new tech offices. 340 Bryant Street was one of the last remaining affordable industrial spaces for artists’ studios in San Francisco. Additionally, during the painting of the “Wall of Shame and Solutions” Wilson was held by a Mission District police officer (with a back-up team of two officers) for 30-minutes for “breaking San Francisco’s Sit/Lie Ordinance” by sitting on the ground while taking a break from painting the mural. SHAME: Uber, Lyft, Sidecar etal. San Francisco is experiencing a massive displacement of its residents, its communities, and its diverse culture – as the high tech industry and its workers continue to move into our City and to recruit more and more of its employees from outside of the Bay Area. Additionally, high numbers of foreigners are buying up property in San Francisco as second or third homes, contributing to the shortage of affordable housing. Those being forced out of their homes and neighborhoods include longtime residents (many who are low and middle income, immigrants, and communities of color), local businesses, and non-profit social service and arts organizations – agencies that act as integral parts to the neighborhoods they live in and serve. It’s been truly heartbreaking to watch so many people who have spent many years creating and contributing to our communities be forced to leave because, while they have plenty of creativity, energy, and love for their neighborhoods, they don’t have enough money to keep their homes, small businesses, and community-based organizations. This is an epidemic rooted in a systemic war being forged by politicians and for-profit interests across the world. In San Francisco it’s a war being led by Mayor Ed Lee (led by Gavin Newsom before him, and Willie Brown before that), District Supervisors, and the Planning Commission, funded by deep pockets with the money to pull these City “leaders”’ strings. 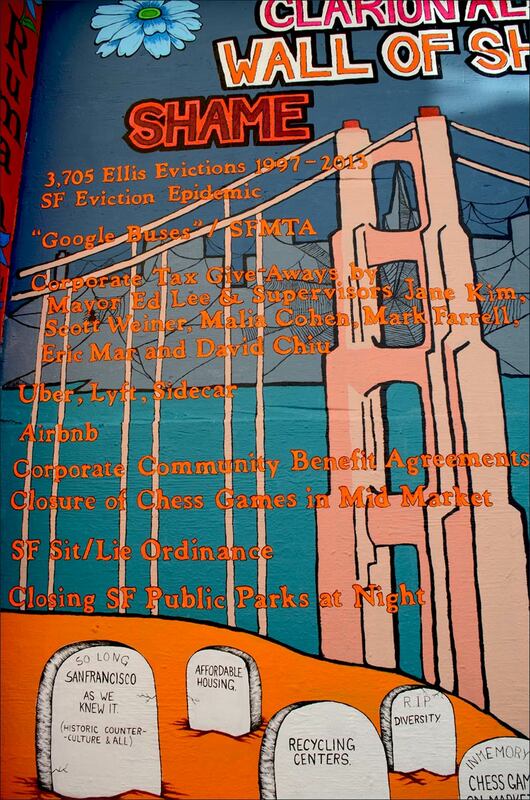 These are the folks who have created and are creating the changing image of San Francisco as “money is the priority,” not culture and/or a voice for the disenfranchised. All eyes throughout the world are now on San Francisco and watching as the city that was once known for its progressive free-love counterculture is rapidly being dismantled by free-market capitalism on steroids. Ultimately the power of the people who don’t have deep pockets lies in calling these interests out, demanding better, and coming up with “creative solutions” to put an end to the powers that are cruelly targeting the most vulnerable populations locally, nationally, and globally.